The Manor House is associated with several historically significant persons, including John Fairfax and the Cooper family, who owned the place for almost eighty years. The hotel has been an important focus of tourist activity in the village from the 1890s to the present time. The Manor House was erected by John Fairfax. Fairfax was born in England in 1804. After migrating to New South Wales in 1838 he purchased the newspaper called the Sydney Herald on credit and in 1842 changed its name to the Sydney Morning Herald. 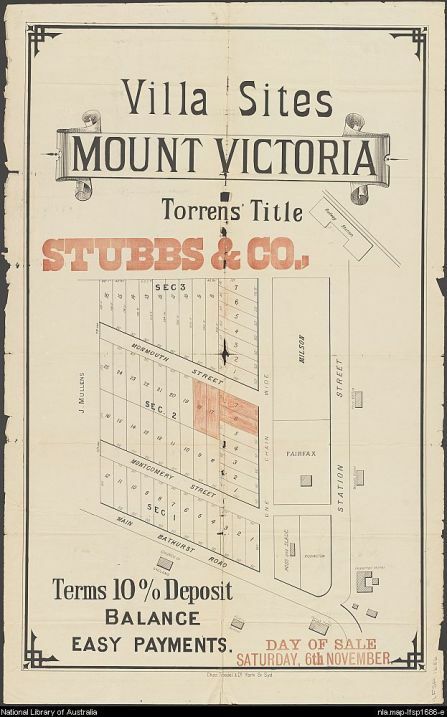 Fairfax was a sufferer from bronchitis and purchased land in Mt Victoria in 1876. He engaged the Manly-based builder, Alexander Dean to erect a single storey house overlooking the township. Fairfax died the following year in 1877. In 1883 the property was leased to George Aitken, who converted the dwelling into a guest house. The house served briefly, and unsuccessfully, as a school in 1885. In 1887 George Hubbard Cooper purchased the property and modified the house before re-opening it as a guest house, the Blue Mountains Manor House Hotel in the Easter week of 1887. Cooper had acquired a liquor license in the name of the Manor House, but changed the name to the Grand Hotel in 1891; the establishment was commonly referred to as Cooper’s Grand Hotel. He had a two storey building constructed next to the original house, onto which a second storey was added by 1900. A private golf course was laid out within the guest house grounds. Cooper also established a coach line for the convenience of those guests wishing to visit the Jenolan Caves. Cooper had acquired a sizable amount of land in addition to the hotel, and subdivided it into a series of allotments along Selsdon Street, around the hotel and along Carrington Avenue and Station Street. The subdivision was called the Carrington Estate, and the allotments were sold off between 1892 and 1913. Many alterations occurred over the next eight years in the process of creating a tourist hotel but the beauty of the house remains with the Fairfax monogram still gracing the entrance and front of the main house. The name Cooper’s Grand Hotel remained so until 1966. The hotel was inherited by the Cooper family and managed over the years mainly by his son-in-law and daughter and Mr. & Mrs. Hudson until the late 1930’s. Article from the Sydney Morning Herald 19th April, 1930. During this time the full hotel license was relinquished. Rumour has it that Mrs. Hudson had become a prohibitionist. Mrs. Ward, Cooper’s granddaughter, was the proprietor from the late 1930’s until the mid 1960’s. She was noted as a very strong willed lady and did not believe in solicitors and such. This was to prove her undoing in that she entered into a contract to sell the property on a delayed settlement and never received payment at all. The agent involved in the contract sold the property to a religious body who had no knowledge of the “shady” deal and they then sold it to another religious sect, The Logos Foundation. The property was broken up and houses built around the rear of it. The foundation housed a commune sort of affair with about 70 people living permanently. During this time the house was called Westwood Lodge and was listed by the National Trust as being a prime example of “Victorian Italianate”. The Logos Foundation moved to Toowoomba in the mid 1980’s where they became involved in Queensland politics. The Logos Foundation sold the property to the Patterson family in 1988. The name was changed back to The Grand and was operated as a guesthouse until purchased by Colin and Annette Lenton in July 1991. The reputation of the house had deteriorated and they went full circle in renaming the property The Manor House as originally stated by the Fairfax family. In keeping with the importance of the property in this World Heritage area it is now known as Blue Mountains Manor House. They have owned, operated and constantly renovated the property from then until the current time, as recently as a major refurbishment in 2011. In a serious attempt to retain all the charm of the historic country retreat they have nevertheless introduced the comforts of modern living such as ensuites, central heating, new dedicated conference room and spectacular sunroom attached and billiards. They have re-introduced a garden and croquet lawn that had sadly disappeared under a car park. Luckily it still retains it’s grand stance on the hill with more than 2 acres of grounds. This page is part of the “Great Places” project of Mount Victoria. Each place in Mount Victoria will, one day, have its own page where its story can be told and some places will have a physical sign with a QR code linking it to its web page for smart phone access to an audio tour or slideshow. This might be historical information, photos or more recent or current information. It can be about people who have lived at or been associated with the Blue Mountains Manor House , links to articles or information about structures at the Blue Mountains Manor House . According to the Blue Mountains City Council, the Blue Mountains Manor House is at 2-12 Carrington Ave but it is best viewed from Montgomery St.